The QLX effect ensures a unique feeling of relaxation which will carry you weightlessly through the day. An incomparable lying comfort experience, only in the box spring system from RUF|Betten. 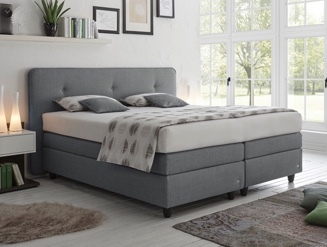 QLX stands for an ingenious box spring bed base with a system for four perfectly harmonised sleep comfort zones for weightless sleep. Our QLX box spring bed system reinterprets traditional box springs: Its QLX 4-component sleeping comfort facilitates virtually weightless rest, so that body and soul can effectively relax and revive through the night. 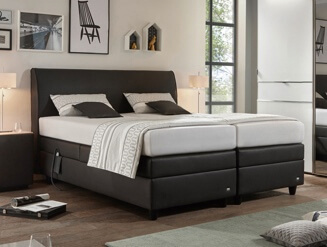 An integrated absorption level that eliminates vibrations from spring core to spring core, ensuring that you fall asleep and sleep through the night in total comfort, offers a very specific added benefit in this box spring system. Vertical chambers in each bed component guarantee a fresh and pleasant bed and room atmosphere. This unique system for box spring beds, designed by RUF and patented by the German Patent and Trademark Office, now finds its way into the VERONESSE luxury classic box spring component program, but also into many other box spring beds in the RUF range. With the QLX 4-component sleep comfort, you always get it right. For the immersion level of the QLX box spring system, select a RUF box spring mattress from the many models and firmness levels on offer – many programs are also covered in your favourite fabric. 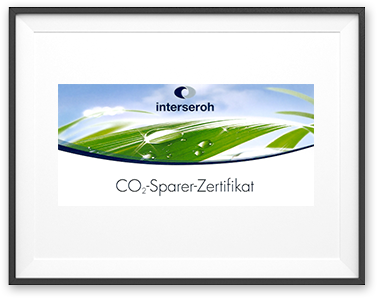 The absorption level is a 7-zone cold foam core with vertical holes in breathable fabric. 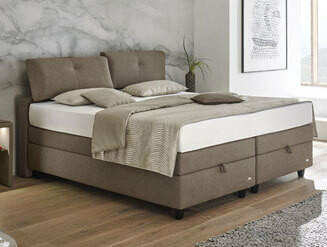 In the luxurious box spring system QLX this level minimises vibrations caused by your movements. Another extra from RUF|Betten: Velcro and slip-resistant nubs on the surface of this absorption level, as well as adhesive stretch velour on the bottom of the RUF box spring mattress securely keep your mattress in place, even when using the fully-automated adjustment. The redistribution level consists of a 7-zone barrel pocket spring core with breathable non-woven cover. It serves to absorb and distribute your body pressure evenly within the QLX box spring system. 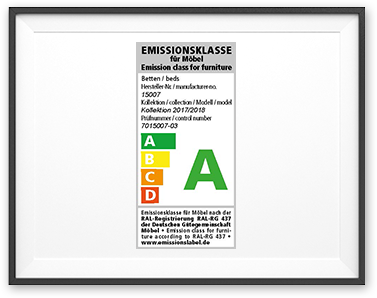 The support level is a base with integrated slats. It supports the box spring system from below and is finished off with an air-permeable fabric. If you opt for a box spring bed with bed box, the ventilated storage is integrated here. This way your bed atmosphere doesn’t struggle for air. The unique AIRVent system achieves an optimal temperature and humidity balance. While the spring cores are naturally air-permeable, special holes in the foam components and millings in the base plate ensure continuous air circulation. And there’s more: The well-designed QLX box spring system offers two ground clearance options with 5 or 10 cm legs. This offers additional support for maximal ventilation of the box spring bed with QLX system. And that guarantees a fresh bed atmosphere – around the clock. The same standard that applies to all beds from RUF applies to our unique QLX box spring system: For us, quality is a value that is made up of many individual components. Only when all these individual components meet the highest standards, can you enjoy the best quality of sleep, all round. This is why the QLX system, as a component of the box spring beds from the RUF program, is tested and certified for the decisive quality criteria of durability, safety and health and the environment – as numerous quality marks demonstrate. 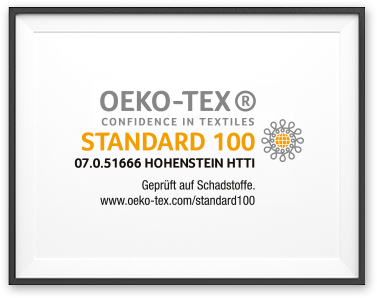 The ‘Confidence in Textiles’ label guarantees that all RUF mattress tickings have been tested for harmful substances in accordance with OEKO-TEX®Standard 100. 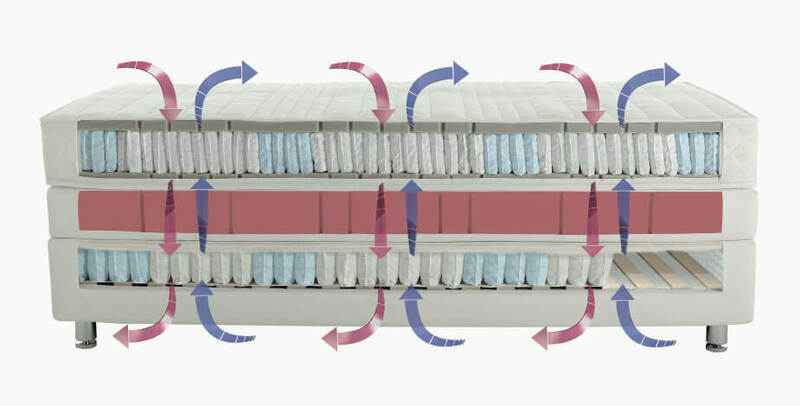 With its 4-component sleep comfort, the QLX box spring system offers true luxury when it comes to quality of sleep. But if you seek even more comfort, RUF|Betten offers the ingenious box spring system in a version with fully-automatic adjustment of headboard and foot section. This allows you to bring your box spring bed MERCATA or VERONESSE into any chosen position via cable switch or (optional) via infrared remote control. 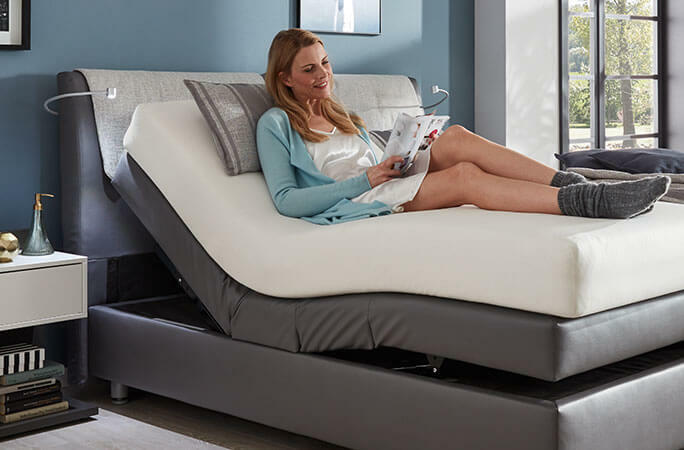 The headboard and foot section can be adjusted entirely independently from each other – for reading, watching TV, relaxing, or simply doing nothing at all. Perfectly harmonised, the four comfort levels of the patented QLX box spring system create an extraordinary lying and sleeping comfort, which no other box spring bed base can beat. And which allows you to relax and recuperate as never before. 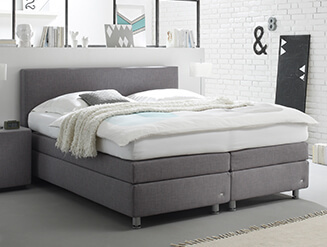 Thanks to the particularly back-friendly lying and sitting height which the system offers your box spring bed from RUF, you always benefit from the QLX effect. Customers who have opted for a RUF box spring system with QLX effect base, never want to do without the QLX effect. 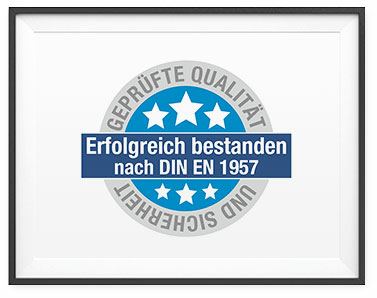 According to the “Deutschlandtest”, the uniquely raised and comfortable lying feeling of the box spring system impresses with outstanding customer loyalty. My wife and I have been loyal and very happy customers of RUF|Betten for over 15 years. Our first bed from RUF was an upholstered bed. Two years ago, we decided to change the “sleep system”, from an upholstered bed to a box spring bed. We chose the RUF bed VERONESSE with QLX box spring system. Once again, we had not been promised too much, the lying comfort is really dreamlike – the spring core mattress does not vibrate when you turn (which makes my wife happy) and the level with the dampening feels as if you were weightless. We don’t regret anything, except the fact that we did not decide on a RUF box spring bed with QLX earlier! I am a staunch fan of the QLX box spring system in my VERONESSE bed – from the first hour! It gives me super-restful sleep, which I never want to miss again. And I don’t have to, as it is of perfect quality. Even after four years I sleep weightlessly and calm through the night and wake up as relaxed as after the first night. What I love about the QLX box spring system is not only the restful sleep comfort that feels virtually weightless. 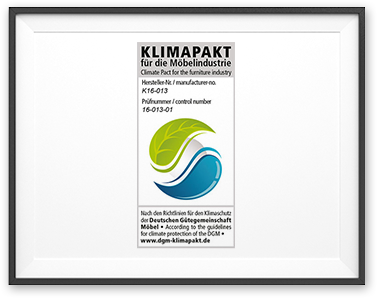 It’s the whole “package”: for example the fact that the vibrations in the spring core mattress are dampened, but, the air can freely circulate. Or, that the four QLX sleep comfort components have such a comfortable lying and sitting height. My back loves this as much as the effect that the body pressure is optimally distributed when lying down. I still remember when I thought, “Please, who needs four sleeping comfort levels in their box spring bed?” After the first night in our RUF bed MERCATA I knew who – me! I did sleep well in our old box spring bed, which was also of very good quality. But not half as good as now in the RUF bed MERCATA with QLX box spring system. I’m really glad that my wife did so much research before we bought, and insisted that we buy a box spring bed from RUF with QLX effect. I am sure that one can also sleep well in a box spring bed without QLX effect – just not as relaxing as in a RUF box spring bed system with QLX effect! It really is great, such a weightless sleep experience. Once you have it, you never want to do without it again, just like me. But it’s difficult to describe. That’s why I can only recommend: Test it out and experience the super comfortable sleep yourself!